New Items added Daily up until Auction Day! Selling Running Construction Equipment, Salvage Construction Equipment, Welders, Air Compressors, Generators, Attachments & More! 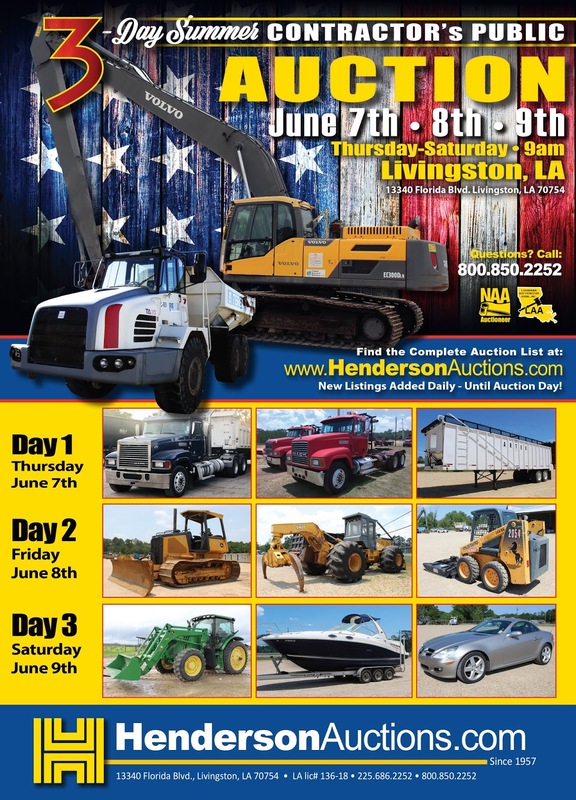 Selling Farm Equipment, Implements, Autos, Pick-Ups, Travel Trailers, RV's, Boats, ATV's, UTV's, Golf Carts and Misc Items! Taking Consignments now for this auction email jcason@hendersonauctions.com or call 225-686-2252. Register for online bidding at the link below. 10% on the 1st $5,000, then 3% on the remaining balance of each item. 3% Additional to Buyer's Premium, on each item. Load Out: Load-Out available on most items on the yard/ramp available, deadline for load-out is Wed., June 20th.